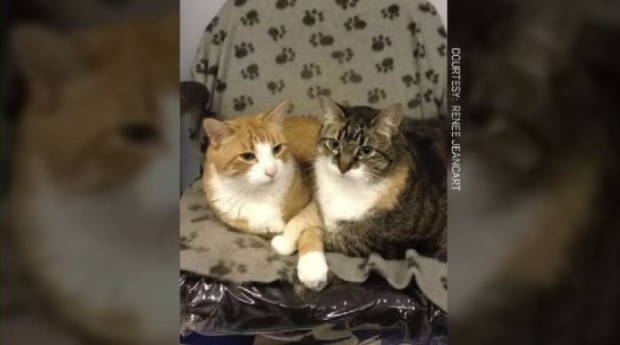 Two cats that had been adopted by a care home in Rosetown have been evicted by the facility, according to a former employee. The cats, Julius and Dora, were adopted by the Wheatland Regional Centre 10 years ago to improve morale for the residents. “It was nice for residents who don’t have a lot of family nearby – it was companionship for them,” said Renee Jeancart, a former employee of the home designed for people with disabilities. Jeancart expressed concern to the Wheatland Regional Centre’s board when she heard the cats were getting kicked out. She received an email explaining the facility was moving to a different building in Rosetown and the cats couldn’t be part of the move because of health concerns. “The cats will not be moving to the new building and they will not be placed in any of the group homes due to health considerations of the clients,” the email read. Jeancart said she was upset and frustrated when she learned the long-time pets were no longer allowed to be with the residents. “I can't imagine being told, as a resident, that I'd have to get rid of my pet after 10 years,” she said. Jeancart is temporarily watching the cats and is in the process of looking for someone to adopt the animals.